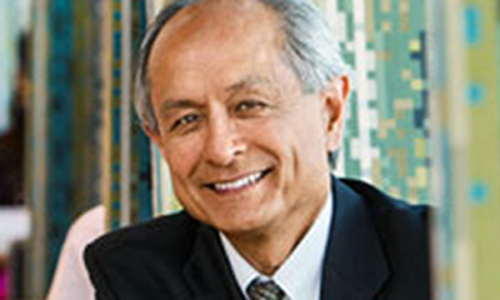 A week-long celebration begins March 9 to 15, 2013 to commemorate the investiture of San Francisco State University's 13th President, Leslie E. Wong. The formal investiture of President Wong will take place Thursday March 14, at 2pm in McKenna Theatre on campus. A celebration dinner honoring President Wong's investiture, and the induction of alumni into the SF State Alumni Hall of Fame will take place on Friday March 15 at the historic Julia Morgan Ballroom in downtown San Francisco. The celebration dinner will be emceed by author and former senior editor of Rolling Stone magazine Ben Fong-Torres, also a San Francisco State Hall of Famer. After a nationwide search, the California State University Board of Trustees named Dr. Leslie E. Wong, as president of San Francisco State University last May, 2012. Dr. Wong, was the head of Northern Michigan University since 2004. San Francisco State University has a campus of nearly 30,000 students. Dr. Wong is a native of Oakland, California. His mother is of Mexican descent from a family of farm workers. His father is Chinese American, and was an executive of the National Dollar Store. What?!! An Asian American male star in a Hollywood movie that isn't a Kung Fu film? Justin Chon ("Twilight"), steps into the spotlight as the lead character in the comedy 21 and Over, opening in theaters nationwide March 1. Chon, 31, was born in Garden Grove in Orange County, California, and was raised in Irvine, California. He attended business school at the University of Southern California. At age 20, Chon began taking acting lessons, inspired by growing up watching his father in black and white films. His father is a former child actor from South Korea. Justin: Hey Suzanne, thank you. Suzanne: You’re right from Orange County, California! Justin: Yeah, Irvine. Yeah, born and raised. I was born in Garden Grove Hospital. Suzanne: Can you describe your role in your new film 21 and Over coming out in theaters March 1, 2013? Justin: Yeah. I play a character named Jeff Chang. It's his 21st birthday and my two friends come up to celebrate with me but I have a medical school interview the next day. They convinced me to have one beer and obviously that beer turns into absolute chaos. My character's just an average kid. He's actually not that smart, he's like failing out of school. Suzanne: What made you jump on board this film? 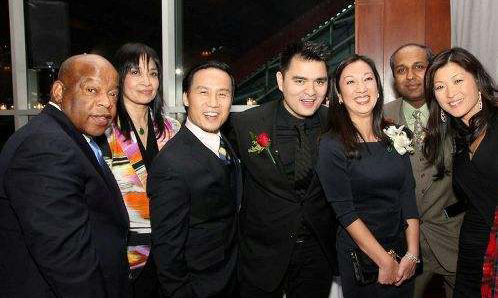 Congressman John Lewis, Member of the U.S. House of Representatives (Georgia), Jose Antonio Vargas of Define American, and Simone Wu of Choice Hotels International, Inc. received the Asian American Legal Defense and Education Fund’s (AALDEF) 2013 Justice in Action Awards at AALDEF’s annual Lunar New Year benefit, held at PIER 60 Chelsea Piers in New York on February 19, 2013. Since 1987, AALDEF has presented the Justice in Action Awards to exceptional individuals for their outstanding achievements and efforts in advancing social justice. The awards were presented by Rep. Grace Meng, the first Asian American to represent New York in Congress, Tony Award-winning playwright of M. Butterfly David Henry Hwang, and Gordon Smith, CEO of Consumer and Community Banking, JPMorgan Chase. Kevin Tsujihara, Warner Bros. CEO Congratulations! Tsujihara, 48, the twenty year Warner Bros veteran was named CEO on Monday and is expected to take over the post March 1. He has been president of Warner Bros. Home Entertainment since its founding October, 2005. He has managed the studio's DVD business, as well as a range of responsibilities outside of the television and movie business helmed by other divisions, from games acquisitions and content distribution via VOD and other digital platforms. Tsujihara received his BA in business administration from Universiaty of Southern California, and an MBA from Stanford University. Its been reported in the news media that Tsujihara has a humble and low-key management style, and was considered a "Black Sheep" of the list of likely candidates for the CEO post. Current chairman Barry Meyer, told LATimes.com "Everyone needs a leader, and Kevin was the best equipped to unify the company at this time." We just thought he was the best for the whole company." He is the son of chicken farmers in Petaluma, California, and grandson of Japanese immigrants. When he becomes CEO on March 1, he will be the fifth CEO in Warner Bros. 90 year history, and the first Asian American to run a major Hollywood studio.